The purpose of the 12th Junior Researcher Workshop on Real-Time Computing is to bring together junior researchers working on real-time systems (PhD students, postdocs, etc). The workshop provides a relaxed forum to present and discuss new ideas, to explore new research directions, and to review current trends in the real-time systems area. It is based on both short presentations and a poster session to encourage stimulating discussions. The Call for Papers can be downloaded: C4P PDF. Submission guidelines: authors can submit up to 4 pages in double column format, in a font no smaller than 9 points font (the Latex template can be downloaded here and the Word template here). Every submission should be co-authored by at least one junior researcher. One author of every accepted paper should be registered to the conference to present the paper in a talk and during the poster session. One co-authoring student of each accepted JRWRTC paper may register with the early registration fee for students shortly after the notification of acceptance. The submission website is now open through EasyChair. 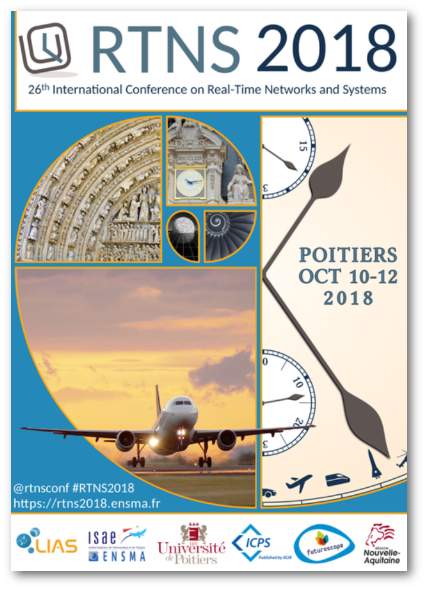 For any questions, concerns or comments, please contact the chair jw-rtns2018@ensma.fr.